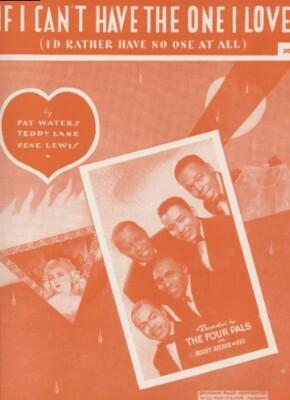 "If I Can't Have The One I Love"
Above: Sheet music/photo of The Four Pals. 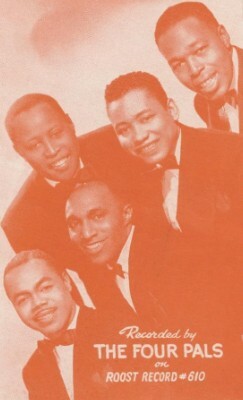 The photo shows leader Cecil Murray, along with Leonard Thomas, Howard Scott, James Riley and Isaac Royal (pianist and arranger). This is the same group as The Rhythm Kings on Ivory (1949) and Apollo (1950-51). Above: Label for Royal Roost 610, released in September 1955. The label states "Music Of The Future", but this song sounds like it's out of the 1940's. In fact, the song was originally recorded in 1949 by The Four Pals, known then as The Rhythm Kings. This group had the second of their two releases on Royal Roost in January 1956. They had one other record, prior to Royal Roost, on Kay 787 "Please Don't Say Goodbye"/"I'm On The Mend". The Kay record may not have been officially released, but some 78's of it have shown up. 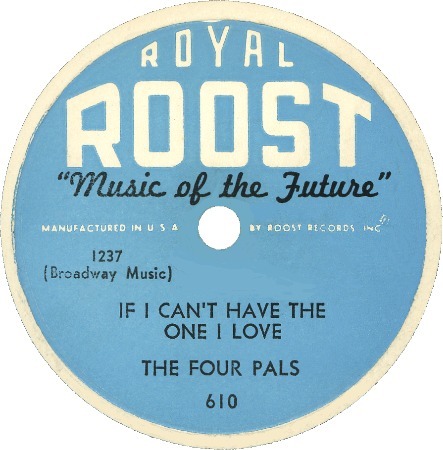 "Morris Levy and the Birdland jazz nitery interests reached agreement here this week to acquire a half-interest in Roost Records. Levy and his partners are understood to have paid out $50,000 for their share. Deal calls for the name of the label to be changed to Birdland Records, with the new capital acquired by the diskery allowing it to launch an expansion drive that would include the signing of new talent and a heavier release schedule. Jack Hooke and Teddy Reig remain in active charge. One of the early projects they have planned involves frequent recording of live performances at the nitery, where artist contracts permit. It is also expected that the diskery artists will gradually be worked into feature spots in the annual Birdland package tour. This will permit cross-plugging of disk and personal appearance activity, according to the formula pioneered by Norman Granz. Formed about six years ago, the Roost label has a catalog of about 120 singles, 15 EPs and 28 LPs. Included in the Roost-Birdland deal is a half interest in Forshay music, Roost's subsidiary publishing firm, a BMI affiliate."